If the popular vote in the 2012 election is down in New York City, you can blame it on the new voting machines -- and , of course, on the devastation caused by Sandy. My own experience at a polling place on West 65th Street near Central Park West was not unusual in Manhattan, Brooklyn and elsewhere. Yet there was no devastation in that neighborhood. No Sandy refugees. 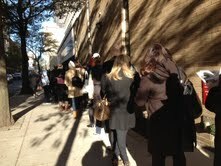 But hundreds stood in line in freezing weather to vote. I waited an hour, starting at 8:30 am. When I left, close to 10 a.m., the lines were even longer. Four years ago with the old, creaky 1962 mechanical voting machines, the wait at the same hour, at the same place, was about 15 minutes. The big voting machines involved levers and the curtain surrounding you would not open if you pressed too many levers (like voting for two candidates for president.) It was reassuring. Now there is the DS200 scanner. It is supposed to be high tech. But you fill out a paper ballot with circles next to a candidate's name. If you do not color in the full circle, but mark an X, it will be rejected and you are told to try again. You take that piece of paper to a scanner and voila, your vote is counted. In other words, you stand in two lines after the initial registration sign-in. But like a cheap printer, my scanner read "paper jam" so I had to get another ballot, etc etc. The poll watchers were helpful, the security guards were extremely helpful but there was no one to repair the paper jam. One poll worker said pamphlets explaining how to do this were missing. The DS200 is manufactured by the Omaha-based ES&S firm and was chosen by the New York Board of Elections, with at least one commissioner saying none of the applicants were satisfactory. Someone should have listened. But New York decided to go high tech. Really? Filling out a ballot by hand with a pen is high tech? Having a paper jam is high tech? Has anyone ever heard of flat screens? Worse yet, several reports have said that the scanner miscounts. At minimum, it's a good case for early voting.